Jane (Jean) Muir ORMSBY was born on 05 October 1897 in Brickrow Farm, St. Quivox, Ayrshire, Scotland, the third of John ORMSBY and Helen Ramsay MUIR’s children and daughters. On 30 October 1924, at Brickrow Farm, 27 year old Jean married James (Jimmy) Crawford McGUIRE, 30, an engineer in the Merchant Marine. Family stories relate that the wedding was a relatively “sombre affair” as Jean’s brother Johnnie had died of consumption five months previously, and her uncle Henry ORMSBY had died the previous month. 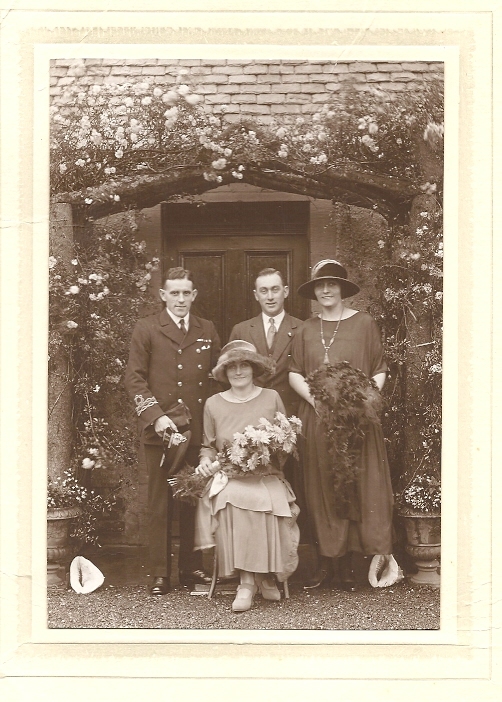 Photo left: Jean, the bride seated, her husband James (Jimmy) McGUIRE in uniform. The witnesses of the marriage were Jane’s sister Margaret (Peggy) Wilson ORMSBY and Robert MUIR, a friend of Jimmy’s. Robert, although his surname was Muir does not appear to have been related to the Muir family of Jean’s mother. The photograph is from the collection of an Orsmby family descendant who still lives in Ayrshire, Scotland. Jimmy spent much of his career as the Chief Engineer of the ‘Queen of Bermuda’. This ship, completed in the early 1930s by the Furness Bermuda Line, sailed the lucrative New York to Bermuda route. The ‘Queen of Bermuda’, and her sister ship ‘Monarch of Bermuda’, were the elite luxury ships of that time. They were known as the ‘millionaires’ ships’, favourites of movie stars and other prominent people. The weekly run between New York and Bermuda took only forty hours in each direction, which allowed four days to be spent on the island. For Jimmy, as a senior officer, it was a glamorous route and lifestyle on a luxurious ship. Jimmy was seldom at home in Scotland with his family since his route lay between New York and Bermuda. Passenger records show that Jean had one opportunity to join Jimmy and they lived in Bermuda from 1952 to 1957. Jean returned to Scotland for a short visit in 1956. Jean loved tropical Bermuda, particularly the garden she grew. In September 1957 both Jean and Jimmy returned to Scotland. Jimmy was 63 and perhaps he had retired? Jean and Jimmy had a home in Mauchline (5 Weldon Road), Ayrshire where Jimmy died in 1969. After Jimmy died, Jean continued to live in Mauchline. She died in 1983, aged 86. She is remembered as a “lovely person, she looked after her sisters and never complained”.